Sarah Wollaston has quit the Conservatives to join the newly-formed Independents Group. The Totnes MP, the first to have been elected via an open postal primary, announced her decision to leave the Tories along with Heidi Allen and Anna Soubry on Wednesday morning. The trio have opted to join the Independents Group, which was formed earlier this week after seven MPs defected from the Labour Party. 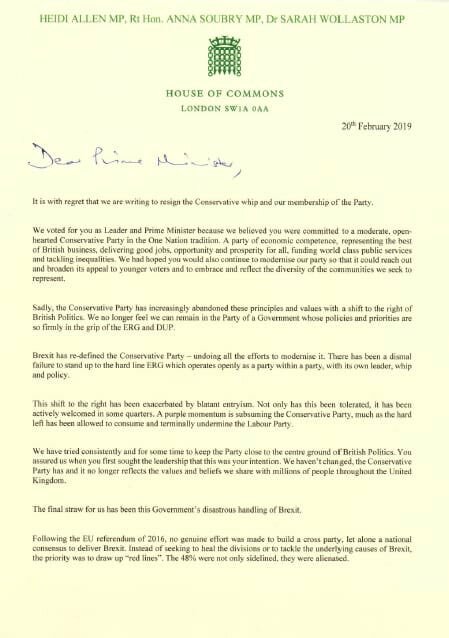 In a letter to her constituents, Dr Wollaston said she could no longer remain a member of a party, “whose leadership has become so driven by the demands” of others. “I do not share their right-wing values or those of the UKIP supporters who have been urged to join the Conservative Party via aggressive and well-funded social media campaigns in order to deselect moderate MPs,” she wrote. The final straw has been the Government’s mishandling of Brexit. Despite the PM losing her majority, no meaningful attempt was made to reach out to heal the divisions left by the referendum or to seek a cross party, or national consensus, on the way forward. The 48 per cent who voted to remain are marginalised and alienated and many Leave voters have also been left exasperated by the PM’s deal. The Totnes Conservative Association Chair said he was "saddened" by Dr Wollaston's departure. The 57-year-old, who was elected in November 2017, went on to blame Brexit for “squandering the energy of Government”. She also said the uncertainty surrounding Theresa May’s ongoing negotiations with the EU, and the prospect of a no-deal Brexit, was partly responsible for some companies opting to leave the UK - like Honda, Jaguar Land Rover and Nissan. With regret, I have decided to resign the Conservative Party whip. I am passionate about this constituency and proud to have been the first Conservative parliamentary candidate to be selected via a full open postal primary. This gave every registered voter in the Totnes constituency, regardless of party affiliation, the opportunity to decide which Conservative candidate they would prefer. From the outset, I have made the case for a centrist, moderate and outward looking approach to our politics. I assure you that I will continue to take that approach but will now do so as an independent MP. I will carry on working constructively with the many hard-working Conservative councillors across this constituency, for whom I have the greatest respect. My decision is no reflection on them. The final straw has been the Government’s mishandling of Brexit. Despite the PM losing her majority, no meaningful attempt was made to reach out to heal the divisions left by the referendum or to seek a cross Party, or national consensus, on the way forward. The 48% who voted to remain are marginalised and alienated and many Leave voters have also been left exasperated by the PM’s Deal. The trade-offs and compromises in the Withdrawal Agreement and Future Framework mean that the Deal is a long way from the unrealistic promises made during the referendum campaign. Brexit has consumed and squandered the energy of Government, Parliament and our political parties. That together with a shift to the right by the Conservatives has undermined efforts to tackle the ‘burning injustices’ that the PM pledged to address on entering Downing Street. We have reached a precarious moment in our national life. Nothing has divided us like Brexit and we now face the serious prospect of crashing out of the EU in less than 40 days’ time with No Deal and no transition. This would not be a ‘clean Brexit’ as some have chosen to represent it. The serious real-world consequences would harm people not only in this constituency but across the whole of the UK and beyond. We are already seeing clear evidence of the consequences for people working in companies like Honda, Jaguar Land Rover, Nissan, Dyson, Fly BMI, Panasonic and for sectors like the pharmaceutical industry following the relocation of expertise and jobs with the European Medicines Agency. It is also starting to hit local businesses. The truth is that No Deal Brexit would deal a body blow to our economy, putting jobs and livelihoods at risk as well as crushing the opportunity to reverse austerity. Having looked at the evidence of the damage it would inflict, I cannot support a No Deal Brexit and I wholly reject the PM’s false binary choice between that grim option and her own deeply flawed Deal. I have for many weeks said that I would resign the whip if No Deal became the stated policy of the Government but also that I would do so if running down the clock amounted to the same. The Labour Party has also changed beyond repair. It is now permanently in the grip of the hard left and tainted by its failure to root out anti-Semitism, these are some of the reasons why several of its MPs have already decided that they too must resign the whip. I will be sitting alongside them in a new centre grouping of independent MPs who share a common set of values, The Independent Group. We agree with the millions of people who feel that neither main political party represents them and that there needs to be a new offer at the heart of our politics. I know that being an MP is an enormous privilege and I remain hugely grateful to everyone who has supported me. I know some will now call for me to stand in a by election but neither this nor a general election would answer the fundamental question that is dividing us… for that we need a referendum on the final Brexit deal. I will be listening carefully to views about The Independent Group and how this could develop in the future. I remain absolutely committed to this constituency.